The U.S. Army plans to purchase some Israel-made Iron Dome missile defense systems designed to counter mortar bombs and other incoming threats through the use of small interceptor missiles, Reuters reported Wednesday. 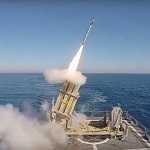 “The Iron Dome will be assessed and experimented as a system that is currently available to protect deployed U.S. military service members against a wide variety of indirect fire threats and aerial threats,” the service said in a statement. Iron Dome producer Rafael Advanced Defense Systems confirmed the transaction. Raytheon and other U.S. manufacturers supply components for interceptors used in the missile defense platform.